Greetings from Germany. You’ve seen the first images that were leaked this morning, but now it’s official – the F54 MINI Clubman was unveiled to the world in Berlin earlier this evening ahead of its show premiere at the 2015 Frankfurt Motor Show in September. Previewed by the Clubman Concept in Geneva earlier this year, the second-generation offering sits on the BMW UKL front-wheel drive platform, which also underpins the new BMW X1 and 2 Series Gran Tourer. As already intimated by the concept, the new Clubman is larger and wider than its predecessor, the R55 Clubman – the car measures in at 4,253 mm long and 1,800 mm wide (R55, 3,945 mm long and 1,683 mm wide), and is 1,441 mm tall, with a 2,670 mm-long wheelbase. The new car is now a full-on six-door, sub-compact estate – unlike the first-gen, which had a suicide ‘Club’ door on one side, the F54 features two proper rear doors in the vein of the F55 5 Door hatch. As before, the model’s rear barn doors sit in place of a hatch tailgate. Design-wise, there’s enough differentiation in all the exterior panels to make it more than a longer F55 5 Door (the Clubman is 27 mm longer and nine millimetres wider) with that trademark twin-door rear. The front bumper, grille and side indicators are unique to the Clubman, and the front section features MINI’s first implementation of BMW’s Air Curtain and Air Breather on the front wheel arches. As mentioned in our earlier report, the rear of the car remains quite faithful to the concept, with the rectangular tail lights set into the barn doors, though naturally the rather aggressive rear diffuser with centre-exit exhausts have given way to a more conventional towards-the edge layout. The car features an entirely newly-designed interior – elements include a dash with a capsule-like design housing four rectangular air vents (the 3 and 5 Door have round side vents) and a high centre console. Elsewhere, the air-conditioning controls and central toggle switches now feature a thicker wraparound surround; a space-saving electronic parking brake and rear AC vents are also to be found. The F54 Clubman also features a new seating position with a better impression of interior width and perception of space. Cargo space is 360 litres, but folding down the 40:20:40 split rear seats increases the total storage volume to 1,250 litres. At point of market introduction, the new Clubman will be available in three forms, two petrol and a diesel. The two MINI TwinPower Turbo petrol units are a four-cylinder 2.0 litre offering 192 hp at 5,000 rpm and 280 Nm at 1,250 rpm (300 Nm on overboost) in the MINI Cooper S Clubman and a three-cylinder 1.5 litre unit with 136 hp at 4,400 rpm and 220 Nm at 1,250 rpm (230 Nm on overboost) in the MINI Cooper Clubman. The MINI Cooper D Clubman, meanwhile, is powered by a 2.0 litre turbo four-pot with 150 hp at 4,000 rpm and 330 Nm at 1,750 rpm. As standard, the Clubman comes with a six-speed manual transmission, though a six-speed Steptronic transmission is available as an option for the Cooper Clubman. As for the Cooper S Clubman and Cooper D Clubman, these can be specified with an optional eight-speed Steptronic transmission, available on a MINI for the first time. If that’s not enough, Cooper S Clubman owners can opt for an eight-speed Steptronic sport transmission. The car will arrive into the market as a front-wheel drive offering, but a conversation with the MINI folk at the launch reveals that all-wheel drive is on the cards, and a base variant equipped with a 1.2 litre mill will also come about eventually. Standard safety kit includes front, side and side curtain airbags, Isofix mounts and the usual raft of electronic safety programmes. Driver assist systems include MINI Head-Up-Display, Parking Assistant, rear view camera and Driving Assistant including camera-based active cruise control, collision and pedestrian warning with initial brake function, high beam assistant and road sign detection. Available specification equipment includes LED headlamps, DRLs and LED rear lights, dual-zone air-conditioning, an electrically-operated panorama glass roof, non-contact opening of the split doors (easy opener) as well as an alarm system that includes a red LED status light integrated in the fin antenna. 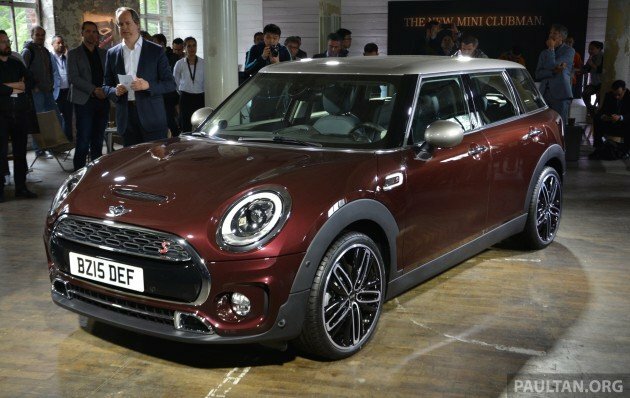 Four non-metallic and eight metallic paint finishes will be available for the Clubman at market launch – colours will include Melting Silver metallic and Pure Burgundy metallic for the first time. It’ll be a while before anyone finds out just how well the new F54 performs on the road – the international drive for the car is only slated in September. Ha ha ha, good description. Wow. Interesting. What a car. Really ugly! Kereta mayat, anyone? hmm… Not nice. The first generation was better. The Clubman, in my opinion, need to look more like a “herse” instead of a hatch. and the tail lights design is too big and it overpowered the design of the rear doors. For me, Mini is difficult to distinguish from generation to generation.